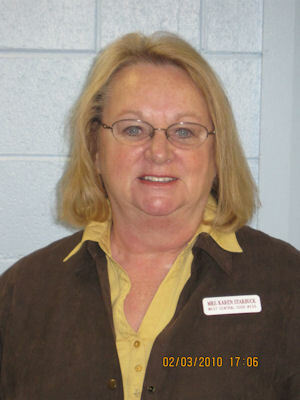 Meet Your Neighbor Karen Starbuck who is a part-time guidance counselor with the West Central School District. Karen lives in Roseville with her hubby, Terry. In July of this year she and Terry will celebrate their 29th anniversary. Karen was born and raised in Raritan and they are members of the Raritan Baptist Church. In 1966 Karen graduated from Media-Wever High School and continued her education at Western Illinois University, Macomb, where she received her bachelor of science degree. Her first teaching position was at Lafayette where she taught home economics 4 years. She then taught at Roseville for a year, teaching home economics and co-op services until 1985. In 1985 Karen received her masters in counseling from WIU and taught at Stronghurst High School until 2004 when she said, "I retired, or so I thought!" After Union and Southern consolidated she returned to teaching part-time as a guidance counselor. Her dad, Max Galbraith, will be 92 years old this year and her mother, Yulon, is 89. Karen said, "It is a great blessing that they continue to live in their own home." Karen has one brother, Max "Buzz" (Eva) who live in Roseville. Max owns his own trucking and lime business and Eva is employed at WIU in food service. Another brother, Chuck, is deceased. Her sister-in-law, Bonnie, lives in Cedar Rapids, Iowa. She has two nephews, Tom, who lives in Olympia, Washington, and is presently getting his helicopter certification and Ryan, who lives in Denver, Colorado. Ryan holds the world's record for distance on a pocket bike (mini motorcycle). Karen said, "Since he is over 6' tall that doesn't make it easy to ride a pocket bike!" She has one niece, Jessica (Ben) who live in Coralville, Iowa. Jessica is a stay at home mom with two sons. Karen is a Warren County Board member for District #4 and past vice-president of Western Illinois Rescue in Monmouth. She proudly said, "Hubby, Terry, is Director of Bio-medical Engineering at Holy Family Medical Center in Monmouth and Director of Housekeeping and Interior Repairs. That keeps him very busy." She and Terry love to travel and take a different vacation every year. Sometimes they drive and sometimes they fly. They plan to see a different part of the United States each year and have been doing that for about 10 years. She also keeps busy in the summer with outside mowing (of which they have a lot to mow) tending to her flowers, reading and spending time with family. She said, "I am very happy in my present position as part-time guidance counselor and enjoy the West Central students and staff."